South Korea’s president on Tuesday urged both North Korea and the United States to “make bold decisions” to break a deepening diplomatic impasse over the North’s nuclear ambitions, saying he’ll continue to act as mediator. President Moon Jae-in’s comments come days before he’s to meet with North Korean leader Kim Jong Un for the third time this year to discuss how to achieve denuclearisation and peace on the Korean Peninsula. Moon said the summit must lead to another “big step” toward denuclearisation. The talks come at a crucial moment in the overall diplomacy, which is currently stuck amid recriminations between Washington and Pyongyang on how to follow through on vows made at a summit in June between Kim and President Donald Trump to rid the North of its nuclear weapons. During a Cabinet meeting Tuesday, Moon said Kim and Trump must think broadly and “make bold decisions” to move the diplomacy forward and get North Korea to dismantle its nuclear arsenal. North Korea has dismantled its nuclear and rocket engine testing sites, but US officials have demanded more serious steps. Kim has reportedly said that his efforts must be reciprocated by corresponding US measures such as a joint declaration to end the 1950-53 Korean War. Moon said South Korea has no choice but to mediate between the two countries to promote dialogue, saying both Trump and Kim have asked him to play such a role. He wants “genuine talks” between Washington and Pyongyang to resume soon. During a visit to Seoul on Tuesday, Steve Biegun, the new US special envoy on North Korea, stressed the need to maintain nuclear diplomacy. “We have some hard work to do. But we also have tremendous opportunity created by President Trump, by President Moon and by Chair Kim. 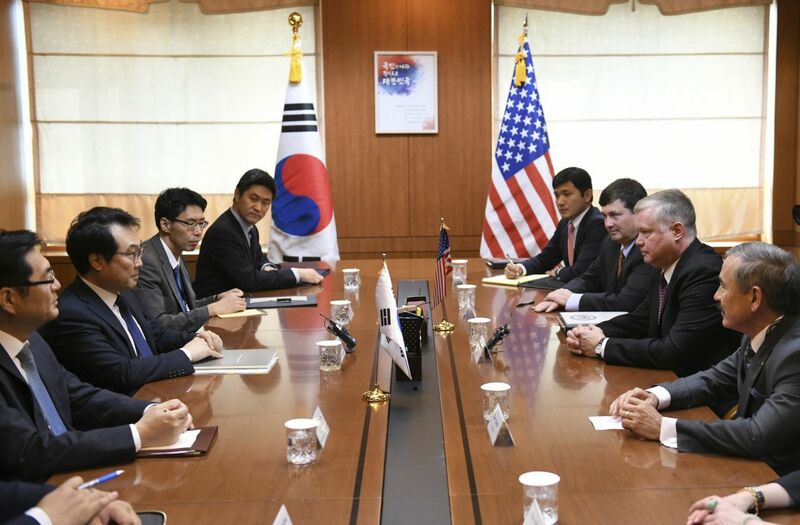 We need to do everything we can to make the most of this moment of opportunity,” Biegun said at the start of his meeting with South Korean nuclear envoy Lee Do-hoon. South Korean officials said Kim recently told them that he remains committed to a nuclear-free Korean Peninsula and said he still has faith in Trump. The White House said Monday that Trump received a request from Kim to schedule a second meeting between them to follow up on their June summit and that planning is in motion to make it happen. South Korea’s Foreign Ministry said in a statement Tuesday that it supports a possible second Trump-Kim summit that it hopes would help establish denuclearisation and peace on the peninsula. But it’s unclear whether deadlocked nuclear diplomacy will be resolved anytime soon. During his earlier summits with Trump and Moon, Kim made vague disarmament pledges without revealing a detailed road map or timetable for his denuclearisation process. The Koreas will hold military talks on Thursday and are pushing to open a liaison office at a North Korean border city on Friday, Seoul officials said, as part of cooperation efforts between the rivals ahead of the summit. Thursday’s military talks will deal with issues to ease tensions along their border, such as disarming a jointly controlled area at the shared border village of Panmunjom, removing front-line guard posts and conducting joint searches for soldiers missing from the Korean War, according to South Korea’s Defense Ministry. When Kim met South Korean envoys last week, the sides agreed to try to find ways to build up mutual trust and prevent armed clashes between their militaries, according to South Korean officials.